January 16, 2012 — Dorothy might’ve went over a rainbow, but her feet landed solidly on yellow. And while we may never know the reason that L. Frank Baum chose green for the Emerald City or silver for the magic slippers, we may know exactly why the road that leads to the wizard is a yellow brick one. And the hypothesis is extremely…visitable. The town of Peekskill, New York, is located on the eastern shore of the Hudson River, about 40 miles north of Manhattan. In 1868, at the age of 12, the Wonderful Wizard of Oz author and native New Yorker arrived in town to begin his two-year stint at the Peekskill Military Academy. That’s the biography, now the theory. 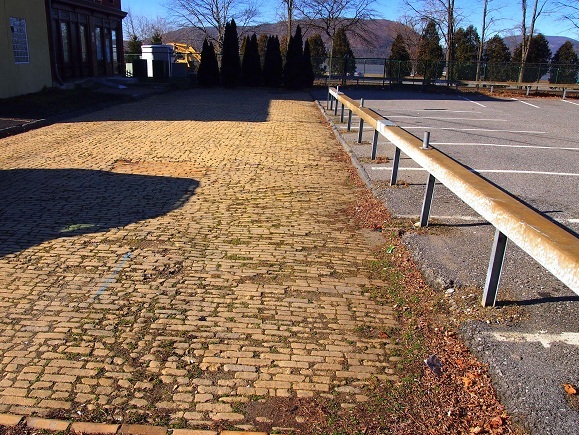 According to local Peekskill historian John Curran, maps reveal that a road, West Street, once led from the river up to the site of the academy (which was demolished sometime after it closed in the 1960s). 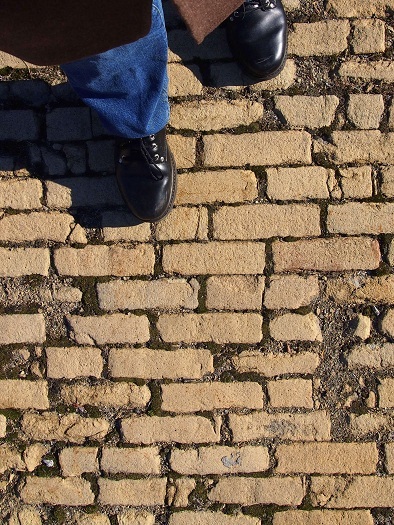 In addition, the Dutch settlers there paved that road with a yellowish brick often used in their homeland and which drew its color from its high lime content. That seems direct and pretty cool. Baum lived for two of his formative years in a town with a yellow brick road. But Curran goes further than that. He thinks Baum probably arrived in Peekskill by way of the Hudson River, in a steamboat. Since he didn’t have a map app for his smartphone, he probably asked directions to the academy when he landed. The inevitable answer? “Follow the yellow brick road.” Which, then, of course, we all imagine him doing while skipping arm-in-arm with a scarecrow and a man made of tin. 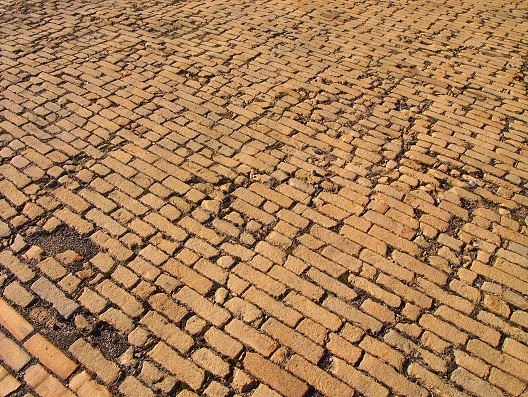 Granted, a few places Baum lived or visited supposedly had yellow brick roads. Enough, in fact, to make it almost too pedestrian of an element to include so centrally in a fantasy story. 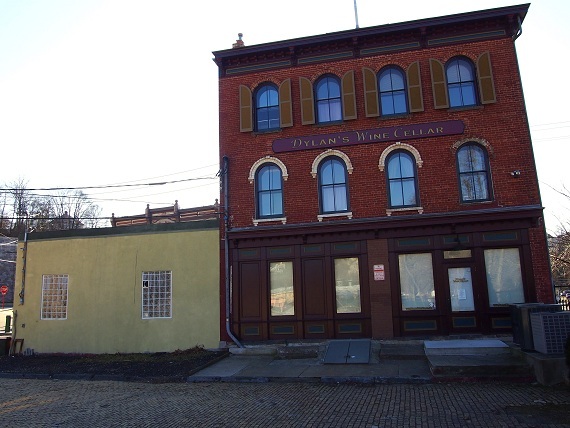 But he did include it, so it can be assumed that the first one he ever saw probably left an impression…and it very well could have been that Peekskill road. Now, I have a credulity prone to compound fractures, but this idea doesn’t even make me twinge, honestly. Still, whether true or not, the theory can at least be checked into even without any research credentials…because a remnant of that yellow road still exists. 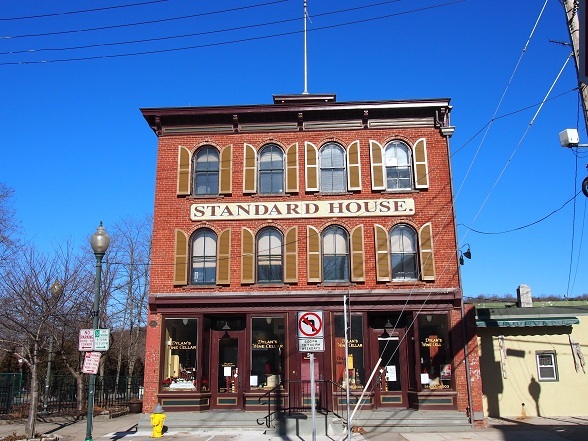 You can find this stretch of faded glory at the intersection of Hudson and South Water Streets, on the property of the Standard House, a three-story, 150-year-old [red] brick building that was originally a boarding house and tavern. Today, it houses a wine shop. Colors may have been saturated for your enjoyment. Directly behind that historical building is a municipal parking long, most of which is made up of your mundane, off-to-see-the-dentist asphalt. However, at the back door of the building and running its length, is the aforementioned patch of possible literary history. You can easily see it in the satellite view of Google maps. The strip runs perpendicular to the river, which is only about 200 yards away across the train tracks and a park. When I visited there was a car squatting on some of it, despite all the open spots on the asphalt part, and it was also half-obscured in the gloomy noon shadow of the Standard House. Pictures online show that in warmer seasons it can be a bit grass overgrown in spots, as well. Nevertheless, the section that was clear and sunlit was definitely striking and had me looking around for fireball-wielding witches and monkeys with wings. But as fascinating as it was to walk on, it was also a bit sad, both because of its condition and also because Baum’s story turned the gleaming road into a metaphor for hope, which has since become ingrained in our cultural brain. A yellow brick road that can’t be followed is just depressing. The ultimate in dead ends. However, far from leaving the rectangles of hardened clay to the forces of decay and the howling dogs of society, Curran is currently leading efforts to restore, protect, and market the pavement. Surprisingly, this decade-long task has not been going easy. According to reports, nobody with serious funds wants to protect the humble stretch of brick, even if it means that the town can boast an Oz-themed wine shop.